As the Financial Times reports, President Yar’Adua’s health has been in question before. It looks like he should be OK this time. But this raises questions about his potential for re-election and about likely successors. In many respects Yar’Adua has been just what Nigeria needs–a leader who unites more than he divides. Umaru Yar’Adua, Nigeria’s president, is suffering from acute pericarditis, an inflammation of the membranes surrounding the heart, according to an unusually frank statement issued by his personal physician on Thursday. Mr Yar’Adua was rushed to Saudi Arabia for medical treatment earlier this week, fuelling fresh speculation about his health in the Nigerian press and prompting questions from opposition groups over whether he is fit enough to remain in office. Doctors at King Faisal Specialist Hospital and Research Centre in Jeddah, confirmed an initial diagnosis of acute pericarditis, a condition that normally takes one to three weeks to treat but in extreme cases requires surgery. In the lead-up to Copenhagen, it makes sense that climate issues will be linked to all the evil in the world. Still, the concern about linkages between weather and conflict are not new in African studies. Ted Miguel’s work has linked rainfall (via the economic shocks associated with it) to conflict in Africa and the murder of witches in Tanzania. Some consider it at the root of the conflict in Darfur. Still, a number of researchers have pointed out that the link between climate change and conflict is — at a minimum — not very simple and perhaps very problematic (see here and here, for instance). Much as Thad Dunning has demonstrated in Crude Democracy that oil need not be the curse we make it out to be, we should be careful to understand the conditions under which climate change may (or may not) impact the likelihood of conflicts in Africa. Last weekend was the annual meeting of the African Studies Association, held this year in New Orleans. Despite the awful timing (why would anyone ever choose to have a conference right before Thanksgiving? ), I definitely enjoyed it. It is a great opportunity to get input on one’s own work from disciplines as far afield as history and anthropology. I find that such feedback can greatly encourage lateral thinking. For instance, I had the opportunity to go to Stephanie Rupp’s talk on Saturday on Ghanaian attitudes towards China’s increasing involvement in infrastructure development. In that talk she discusses China’s involvement in constructing the Bui Dam in Ghana, a subject I am studying as well. But the neat thing is that she does this from an anthropological perspective, drawing on survey research. One of the highlights of a conference like this, especially for young faculty such as myself, is getting to know others who are doing work in similar areas. Since my graduate student days, I have found participating with the African Politics Conference Group to be a great way to meet a lot of these people. One of their more interesting upcoming projects is a mentorship program for graduate students. Much of the time, there is only one Africanist teaching in any given graduate program. The idea here is to create a pool of Africanist professors that graduate students could call on when their own research interests/needs cannot be met within their own department. I also think this could be an excellent way for those of us teaching at liberal arts colleges to have occasional engagement with graduate students. Sandra Joireman (Wheaton) is one of the current organizers of this initiative. 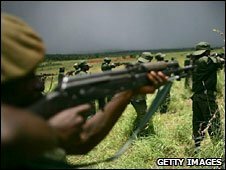 The BBC reports today how humanitarian aid was used to facilitate military action in the DRC. Doctors without Borders (MSF) is one of the bravest and most savvy of aid organizations. If they ever choose to leave the region, many will be worse off. The Democratic Republic of Congo army has used vaccination clinics as “bait” to attack civilians, says aid agency Medecins Sans Frontieres (MSF). Thousands of Hutu civilians were targeted when they visited sites set up to combat a measles epidemic, in areas controlled by the rebels, MSF said. It denounced the attacks in North Kivu as “an abuse of humanitarian action”. My students are doing a fantastic job in our current Introduction to International Politics. Israel and Iran: Not very friendly towards each other.